As these articles have a layer of pure silver all over, the look & wear like pure silver articles, the effect of the atmosphere & food on them is also the same. To maintain glossiness, use soft sponge with warm soap solution for cleaning. If the articles are not in daily use, they should be completely dried & stored in plastic bags. Use Colgate tooth powder (dry) when the stains are not easily removed by the above process. 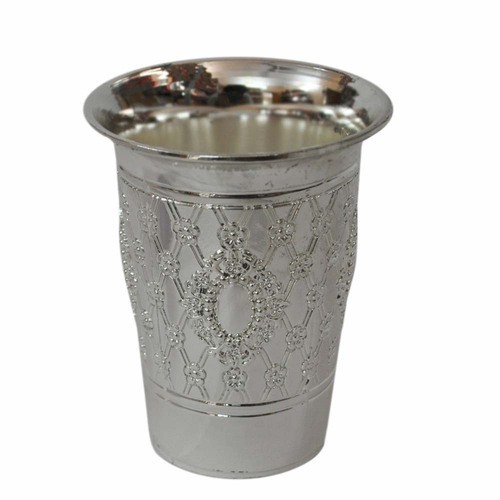 Our organization is a ISO CERTIFIED COMPANY 9001:2008 and a reckoned name engaged in manufacturing and supplying an extensive collection of Silver Plated Articles like Pooja Sets, Tray Bowl Sets, Glass Tray Sets, Gheepot, German Silver, White Metal, Handicraft, Bajot Patla & all Purpose of Silver Plated Articles. Catered assortment of our products is available in various beautiful designs, vivid patterns, different sizes, shapes and other specifications. These products are widely used in homes, temples and many more places. Moreover, we have employed a highly efficient team to provide the products containing utmost quality. In order to be competitive in the market, we have installed a vast infrastructure facility that is stretched over a wide area. It is also outfitted with the latest tools and machinery that enable us to craft around 20,000 sets in a month. Next, a capacious warehouse facility has also been developed to store our bulk consignments safely. We have also qualified research and development squad to improve the quality of our offered products, at regular intervals. In order to ensure smooth operations, our firm is also equipped with the higher capacity power backup.